I got a workbench! A custom-made-for-my-5'1"-self workbench! Wanna see it? Here it is! As I've gotten handier and taken on more and more projects, I realized that I really need a dedicated workbench for doing projects and for storing my tools and hardware. I looked around but the workbenches I saw at Sears or Lowe's or Home Depot weren't doing it for me - they were pricey and didn't seem to fit the bill. Plus, they were all out of the box, which meant they were just too tall for me. My dad is handy and has a workbench so I talked to him about it. He offered to build me a simple one to my specific measurements. It would be nothing fancy: just 2x4s, some posts and planks, plywood, and peg board. But oh my ... I was so excited and it sounded perfect! Next, I figured the size of the bench and sent the measurements to my dad. He cut all the lumber at his place and then came up to my house on a Friday, when we assembled the bench together. I wish I could do a tutorial, but my dad is the mastermind behind this build. It took us 5 hours to build the bench (he had already precut almost all of the wood that we used). Here is another picture of it finished! Aren't those stripes to die for? They're fun and feminine but not too silly or girly-frou-frou. Let's talk about your home work area! Do you have a work bench or a dedicated work space for projects? Where do you get 'er all done? oooh Shanna I am totally jealous!! My own workspace, that would be wonderful! You are quite handy with the power tools, I'm still not there yet, I'm a little chicken with the power tools! Love it! 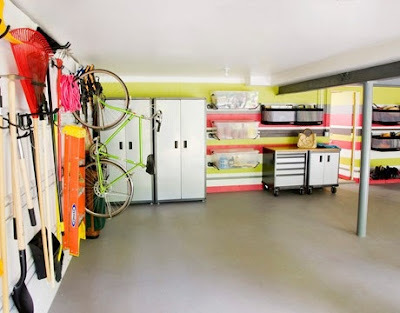 I wish I had a crafting space, but unfortunately, my garage is taken up with all of my husbands stuff. I'm super jealous! What a great idea - I'm only 5'2" so I would love to steal this ;) Just discovered your blog via Maury's - I'm a new follower! Looks great so far! LOVE those stripes!! Thanks everyone! I'm so happy with it. I can't wait to get started on that room ... though it should probably wait since it's hidden from sight. So much to do in the new house! Very cool! Oh, I can't wait until we move in a new house and have ample room for something like this. Hi Shanna, lovely to meet you and your gorgeous blog! I'm following!